The National Weather Service has issued a correction. The tornado watch below is a rare "Particularly Dangerous Situation Tornado Watch." A Tornado Watch has been issued until 11pm for southern Kansas. It includes the Greater Wichita area. There is also the potential for hailstones up to 4" in diameter. 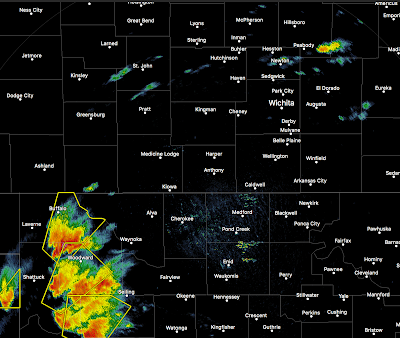 Strong thunderstorms at 3:23pm are already approaching the southern border of Kansas from Oklahoma. At minimum, these storms are currently producing large hail. Thunderstorms are also developing northeast of Wichita which will move into the tornado watch area below (scroll down). Please scroll down for additional safety information. For additional storm information, follow me on Twitter @usweatherexpert . I do not live-blog storms any longer.